Your subscription was successful and you will receive an email shortly with your FREE eBook. So go to your inbox right now and check. If for some reason the email doesn't arrive in your email inbox, then check your SPAM folder. PS. 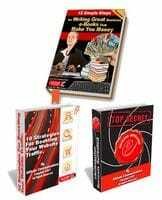 - While you're here, I invite you to take a look at some of our business boosting eBooks and do-it-yourself information products available right now! Click here to see which one is best for you.